The national flag of Burundi comprises of three colors i.e. green, red, and white linings. It was adopted by the state immediately after its independence from Belgium in 1967. The color combination of Burundi Flag is white saltire that amalgamates into three stars at the center and cuts the green and red colors combination in four patterns. The left and right sides of the national flag of Burundi are green areas while the upper and lower portion is red in color. There are three red stars in the center surrounded by white-colored circular spacing. There is a white cross depicted in the flag that also encloses three six-pointed stars in it. 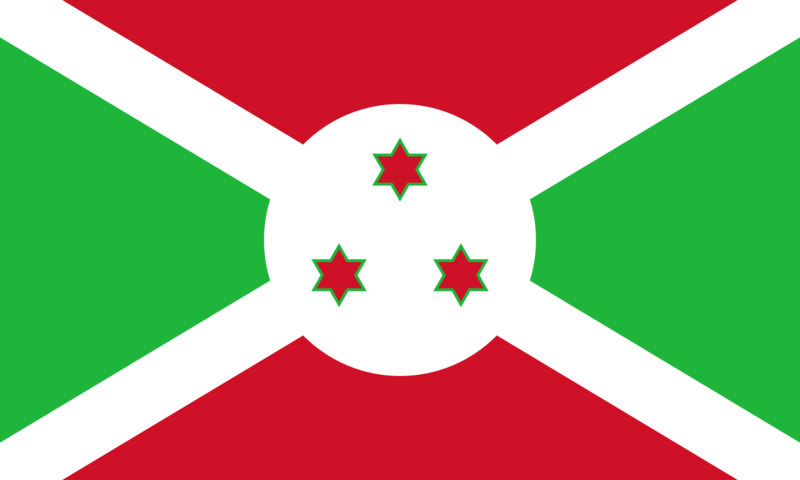 According to the makers of the national flag of Burundi, the white color shows peace, green color represents the future prospects and anindication of a bright future of nation while the red color is dedicated to the freedom fighters, their contributions, and sacrifice with blood for the country. From the year 1967-1982, the flag ratio remained 2:3 that changed to 3:5 afterward. At last, the three stars seen in the center of the flag represent the three major ethnic groups of Burundi. The three tribes are Twa, Tus, and Hutu. The stars are also entitled as the three elements of the national motto of Burundi i.e. Unity, Work, and Progress. According to some other sources, the three six-pointed stars are the symbols of loyalty for the people of Burundi for the God, King, and Country. Before independence, amonarchy ruled and Burundi’s flag featured a drum called Karyenda that was believed to have godly powers. The drum was exactly at the same place where the three stars are present. The divine drum was said to whisper only in the ears of the men in power in the national flag of Burundi before the revolution for independence.